We may be hardened cynics here at Trois V, but sometimes the jaded façade cracks just a little bit, and the soft gooey core leaks out. Today's ride applied just such a toffee hammer to my shell at least, and brought out some of the joy of cycling. It also brought to mind the thin line between horror and happiness - more of that later. 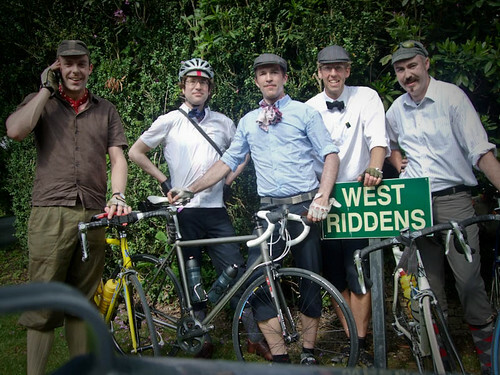 It was the Rapha Gentleman's Team Time Trial, and I was fortunate enough to be a member of the Tweed Run team. Decked out in some Dromarti leather cycling shoes (review to follow), Rapha 3/4 shorts, merino 'tweed' socks, a crisp white shirt, bow tie and topped with a tweed cap (and all-important helmet), with fiver fellow tweed runners, we set off to Brighton and back from the Rapha Coffee Club at 9 am, meaning to stop at three checkpoints en route. We were one team of twelve (including a noble team from our friends at Look Mum No Hands); such was the lack of faith in our vitesse, we were earmarked as the first team to head off. A wise move, on Simon Mottram's part, as we couldn't even manage to get to the photoshoot on the start in time (one member was completing his photo release; the other was voiding his bowels). No matter, we headed off. Given the tweed ethos, we thought it appropriate, and even apposite, to avoid major roads, and seek out minor routes that were the way things used to be. Sadly, an irritable GPS and lack of faith in a paper map led to a bit of a delay around Mitcham, until we got our groove on, and found a delightful route across the north downs. Alas, a near-tragedy took place, thanks to West Sussex's inability to fill in potholes, and an ambulance had to be called. At the very least, the poor victim was wearing a helmet, after some discussion last night, the conclusion of which was that it would be a good idea. It was. Now for the science bit: stress and shock causes the body to do various things, including eating up all the sugar it could find. From this point on, we were at the risk of bonking. We did out best, and I managed to get up Ditchling Beacon with some dignity, the Rapha cameraman pointing his videocam in my face the whole way up. I tried to evoke Lance Armstrong's blankness, crossed with the elan of Eroll Flynn. Needless to say, I didn't manage it. Brighton was a sunny treat, helped by Hannah's cheer and the Rapha coffee van. The Bike Show's Jack took a dip in the sea, and I paddled. Fish and chips were eaten. We decided to celebrate the spirit of things, and to turn the day into a jaunt. This was accomplished by an ascent of Devil's Dyke (one of our number goes by the online moniker of General Lucifer), and a fine selection of minor roads, tracks and byways. Games of cricket were observed. Amusing cycling signs became photographic opportunities (see above). Gentlemanly banter ensued. Passers by were greeted with waves and doffs of cap. The icing on the cake was the golden sunshine and a pub in Ansty, which was staffed by two friendly barmaids, who appreciated our tweedy attire. Due to the aforementioned delays, and the need to meet various partners, parties and trips back to Leeds, we were forced to take a train for the final tedious forty miles. No matter, we still took on the worst of the hills, cut a good dash for the cameras, and managed a good average speed over a decent distance when things weren't going horribly badly. And in warm tweed. Back to Rapha Cafe, for a special award of Prosecco, and a very decent party. stop press: contact from Matt, who admits he won't be winning any beauty contests, but is looking forward to some RP laps. And finally, thanks to Rapha, to Ted and Jacqui, to Hannah and the Rapha van crew, to my fellow Tweed Runners for forming such a debonair, yet skilled peloton, to the passing nurse and locals on Fox Hill, and, most of all, to the hugely professional West Sussex ambulance service. A debt of gratitude is indeed owed. I'm putting my money on Matt as the bowel-voider. Tweed jacket was jettisoned early in the day, leaving only some lovely, soft Merino 'tweed' socks. What was in the tweed jacket when it was jettisoned? Is this finally an answer to the abandon/scrape it off debate? Simply handed to a willing valet. Contained nothing other than a spare bowtie and some braces. Wonderful account, my good man! It was a real pleasure to ride with you, and your unswerving bonhomie on hill, flat and descent helped assuage the hardships encountered on the jaunt. I am endevouring to lose some of the excess poundage from the midriff and lend some steel to the thighs, in the hope that I can match your deceptively easy climbing style on the next outing. Likewise, a delight, and a delight to ride with such gentlemen of style, wit and substance.